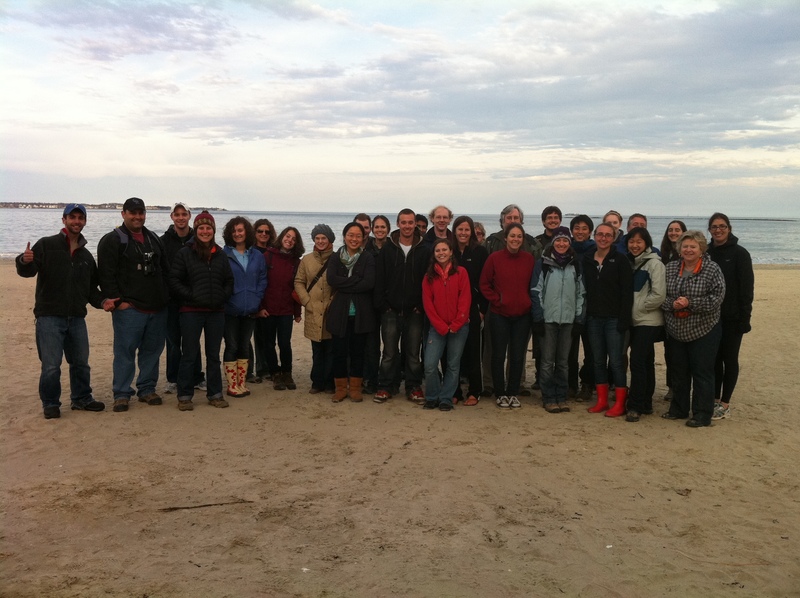 SEANET and college students hit the beach–woooo! Spring Break! Our own Dr. Julie Ellis (blue coat) holds these students in her thrall! OK, it wasn’t THAT sort of trip. 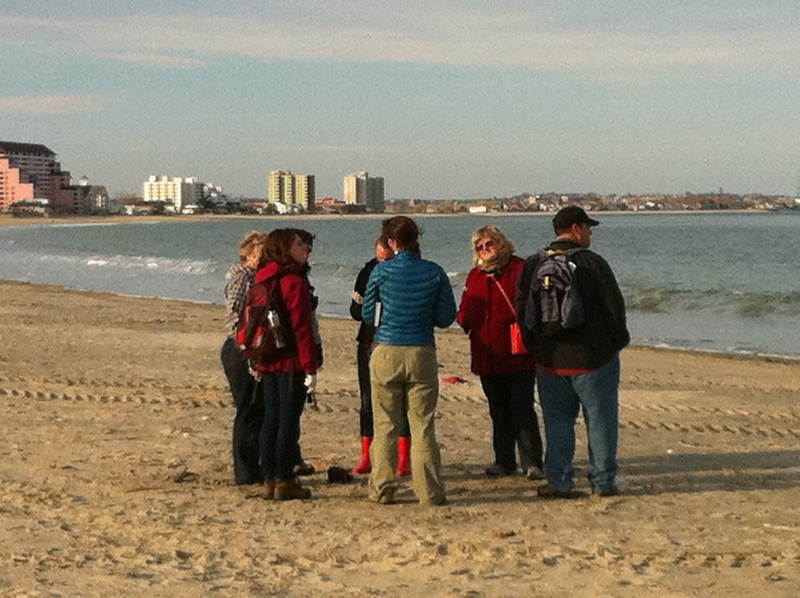 Julie Ellis and I headed out to Revere Beach in Massachusetts today (just north of Boston) to meet up with Tufts University’s OneHealth class. 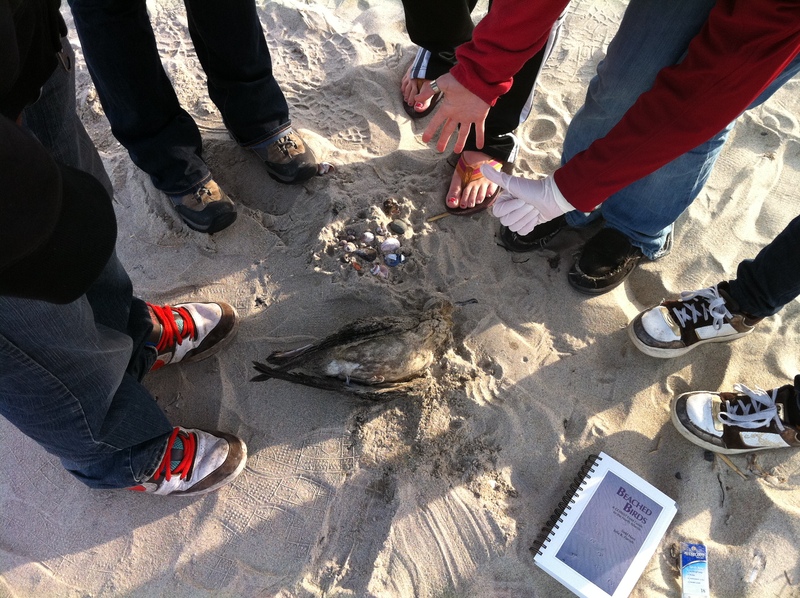 20+ undergraduates joined us for a mini-beach walk and staged carcass encounters. We are extremely grateful to Seanetters Linda McCallum and John Galluzzo, and SEANET alum Andreas Eleftheriou. The three of them made the trip to Revere to give their individual perspectives on our program and what it means to them. Having already made the basic commitment to SEANET walks, they have now gone above and beyond and have attained the status of SEANET superstars. While they spoke, Julie and I raced about burying a trash bag’s worth of carcasses in the sand. After this comically surreptitious activity, the students worked in small groups to locate, unearth, and identify the birds. They put the Beached Bird Field Guide to good use, and did an excellent job identifying the species despite having little, if any, birding experience. Even the most squeamish among the students sidled up eventually. The students asked thoughtful and thought-provoking questions, and I hope they had as much fun as we did. They also were compelled to check out the blog as part of their course, and had a great many complimentary things to say about it, for which I am sincerely grateful. Thanks finally to Gretchen Kaufman and Michael Reed, the course directors who showed dubious judgment in inviting us out. We hope you are not now slumped over a bar somewhere trying to erase the episode from your scarred minds. The Tufts One Health crew!